For the last 2 to 4 years, many companies have paid more attention to reducing their energy costs. Why? In the face of sharply increasing energy prices, the costs of manufacturing products rise, and global market forces often limit or prohibit passing through these costs to the consumer. The result is lower profit margins. This is especially true of the chemical and petroleum industries. The plants in these industries are very large and often energy-intensive facilities to operate. Because the chemical industry has always been a purchaser of energy, a significant component of a product’s manufacturing cost is energy expenditure. The petroleum industry is an energy producer, so it was often thought (even by oil-company management) that energy consumption was not an important factor. Once it became apparent that energy costs amount to more than 50 percent of the cost to refine crude oil into its various end products, many oil companies took a much greater interest in energy savings. Some of these companies—including DuPont, General Electric, Celanese Corporation, Sunoco, Inc., and Marathon Petroleum Company, LLC—have recognized and included insulation-system improvements in their energy-improvement plans. Why? Improving their insulation systems saves millions and often billions of Btus of energy; tens of thousands to millions of dollars annually; and thousands of tons of greenhouse gas emissions like carbon dioxide (CO2) and nitrogen oxide (NOX) compounds. The factors often overlap. For example, hot-service piping insulated for heat conservation and energy management also can be insulated for process control and to offer protection from burns. Piping insulated for process control also inhibits freeze-up. This article discusses several cases of progressive companies that recognized the benefit of focusing on insulation improvements and often got more than they hoped for in the process. 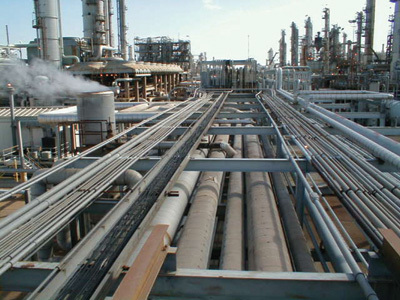 A chemical plant in the Texas Gulf Coast requested an assessment of its steam piping insulation systems and one of its more energy-intensive production units because the company’s management suspected they could save significant energy and money. They were right. The project identified over 4,500 linear feet of piping insulation that needed improvement. The result of the insulation upgrade project yielded more than 90 billion Btus saved and a return on investment (ROI) of more than 160 percent. It is important to note that the ROI was based on an energy cost of only $3.50 per million Btus. Using today’s cost of energy, this would have resulted in an ROI of at least 300 percent. These results alone would easily justify the improvement. However, that was not the only benefit the plant received. 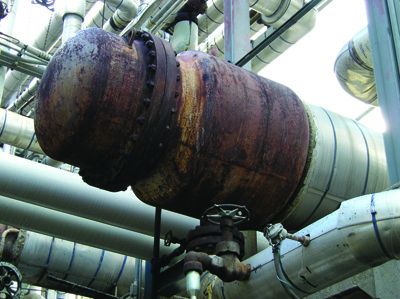 The existing steam piping insulation had extensive damage to the aluminum jacketing—small perforations in the jacket as well as sealant failure scattered along its length—indicating that the extensive rain in the Gulf Coast area was getting into the insulation, ruining its efficiency. Interviews with the powerhouse personnel confirmed that the plant had to increase steam generation by 25 percent just to maintain sufficient pressure in the steam piping during a rainstorm and for a significant time afterward. Once the insulation systems were repaired, however, the rain could not enter the insulation, saved energy kept a significant amount of steam from condensing in the distribution piping, and the powerhouse did not have to add nearly as much generating capacity to keep up with the plant’s steam demand. This made the powerhouse easier to operate and resulted in energy savings. The steam that was condensing in the main distribution piping was overwhelming the existing steam traps. Before the assessment, plant maintenance personnel thought they had problems with the steam traps and frequently replaced them. The steam traps actually had been overwhelmed by the amount of steam condensate and were working as well as possible to remove all of the excessive condensate from the steam piping. The insulation upgrades and repairs all but eliminated that problem. The excessive steam condensation caused other problems, too. Production units located farthest from the powerhouse had trouble with steam pressure during rainstorms, even though the powerhouse added steam-generating capacity as fast as it could. For example, a 150-pound-per-square-inch (psi) steam line is normally around 350° to 365°F, but it would fall well below 300°F during a rainstorm and for some time afterward. This meant the production units were not getting the temperatures needed in their heat exchangers, etc., to properly run their facilities and manufacture product. The insulation upgrades significantly improved the steam-pressure loss and made it easier to operate these production units. The excessive steam-condensate problem in the main distribution piping put a strain on the relationship between the plant owner and some tenant facilities. These tenant production units were sections of the plant that had been sold to other companies in the past due to the sale of certain product lines. These production units were paying for utilities, such as steam, based in part on the amount of direct steam they consumed. However, they also shared the cost of the steam generated in the powerhouse that was lost before it reached any of the production units. This was a high-cost item that the tenant facilities were paying for but not getting any benefit from, and they objected—loudly. Fortunately, the insulation upgrades to the main steam-distribution pipelines significantly reduced steam condensation before it reached the production units, reducing the loss and cost accordingly. The upgrades to the plant’s steam-system piping and hot-service insulation not only resulted in large cost savings, but it also improved process efficiency and owner-tenant relations. A petroleum refinery in the Northeast underwent an insulation assessment that resulted in an insulation upgrade project for one of its major production areas. Like the chemical plant example above, the goal was to save energy and money; and, like the example above, the project succeeded, netting billions of Btus saved and an ROI of more than 100 percent. Part of the project involved insulating sections of large equipment and piping, heat exchangers, steam turbines, and valves that had never been insulated before. In other cases, significantly damaged insulation was upgraded with new materials. Often these new insulation systems were removable. A turnaround in an oil refinery is a complex, expensive, comprehensive maintenance procedure involving hundreds of personnel working around the clock to maintain and refurbish equipment they cannot otherwise get to while the refinery is in operation. The goal is to get the maximum amount of work done in the minimum amount of time for the obvious reason that while production is shut down, the refinery cannot make product or money. Once a turnaround is completed, there are often insulation systems that were intentionally removed or otherwise damaged as a result of the turnaround that still need to be repaired or re-installed. This process took up to 6 months in the past and resulted in the unit being unable to get up to full operating capacity during that time. Unit management noticed something impressive after the next scheduled turnaround, however. With the assessment, the production unit personnel noticed that, because of the use of removable insulation systems, the unit was re-insulated and effectively up to full operating capacity within 2 weeks. Also, fewer personnel were required. The result was a savings of thousands of dollars in turnaround costs and, more importantly, the ability to reach full operating capacity more quickly. For an oil refinery in the current business climate, this is a large savings and an opportunity to make more products available to sell in a “sold-out” market. The same Northeast oil refinery mentioned above had another insulation assessment performed to help develop an insulation upgrade project for one of the largest production units on the refinery. Again, the goal was to develop a project that would save a significant amount of energy and, therefore, energy cost. The resulting project delivered impressive energy savings. Although designed to net considerably more than 240 billion Btus and an ROI of more than 340 percent, the project’s final results were actually better—by around 25 percent. The annual savings to this production unit were well over $1.5 million, and the greenhouse gas reductions of over 19 million pounds of CO2 and 38,000 pounds of NOX were equally impressive. This project contributed to the safety of the unit’s workplace. More than 150,000 square feet of bare surfaces, with an average operating temperature of 400°F and peak temperatures higher than 700°F, were now insulated and no longer posed burn hazards to personnel. With more hot surfaces insulated, local ambient temperatures in the unit will be lower during summer months, when heat exposure risks—like heat exhaustion and heat stroke—are higher. The beauty of this successful insulation project is that it resulted in both a large energy-cost savings and an improved safety climate for the production unit. 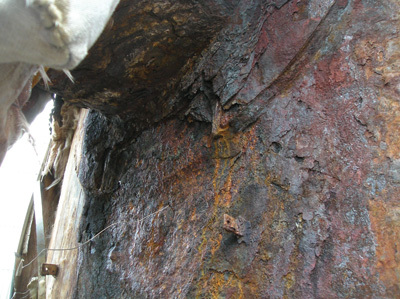 An oil refinery in the Northeast had a problem of corrosion under insulation (CUI) in its water-treatment area. Piping and equipment were corroding in several areas, causing expensive equipment and piping repairs. An insulation assessment was performed to determine where insulation problems might be contributing to the issue. 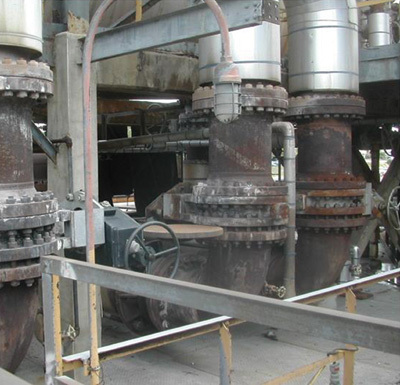 The operating conditions of this piping and equipment were near ideal for CUI—operating temperatures were around 200° to 250°F, and insulation was applied over uncoated surfaces. The condition of the insulation systems, the materials selected, and, in some cases, the installation methods proved to be the biggest contributors to the CUI problem. Any damage to an insulation system in the unit let rainwater into the insulation system, but there were insufficient operating temperatures to adequately dry it out again. One problem was that a compressible insulation material was installed under aluminum jacketing. All areas where personnel came in contact with insulation would end up deforming the jacketing, breaking the sealant seal, and often cutting the jacketing. This was aggravated in some cases by poor installation of the insulation, incorrect location of the horizontal lap to provide good watershed on horizontal piping, and vertical end-cap construction that diverted water into the insulation instead of shedding it. A project was developed and executed, using a different, structurally rigid insulation material along with different installation requirements. To help prevent future problems of this size, the refinery strengthened its requirements for under-insulation coatings on carbon steel and 300 series stainless when the operating temperatures are between 200°F and 300°F. Although the project’s main goal was to improve piping and equipment reliability, it saved energy money, too. The project yielded a savings of over 32 billion Btus and an ROI of around 100 percent—not bad considering the initial goal was to keep equipment from corroding. All of these successful assessments show that proper installation and maintenance of industrial insulation saves more than just energy. This is especially true in the chemical and petroleum industries, where significant savings and greenhouse gas reductions also result from insulation improvements.